Two before dawn up and a-ways in one week.. I'm impressed :) Yesterday morning we arrived at Lake Leschenaultia, an hour east of Perth, just after sun-up to bushwalk around the lake. I do a lot of everyday walking but this was my first proper bushwalk in a while. The lake looked incredible in the early morning light.. snapped this just after 7am. There are two walks, one short loop that circles the lake and a longer figure 8 track into the forest on the western side. To be honest I'm not sure which track we followed.. I walk, enjoy and leave the directional logistics to P.. Following the walk trail into the forest we lost sight of the lake for about 5kms. Early morning walks in the Australian bush are quite an experience, yes there are 'things' to look out for, but by the time we came along the trees were alive with birdsong and any spiders had retreated to their daytime safe place..
As early as we were many had been there before us.. we, and by we I mean P :) spotted the slithery tracks of snakes and kangaroos crossing the track. All in all we walked 7.5km and by the time the lake came into view below, I was more than happy to see it. We went at the right time, it turned into an unseasonably warm day, 31C. Happy Monday, take care and stay safe.. There is a cafe at Fremantle Harbour where you can sit and watch the coming and going of boats into the harbour between the lighthouses on the South and North mole above. I would have preferred if a tall ship in full sail had blown into harbour but as unexciting as a container ship is, it's the tugboats that are always a delight to watch. Sturdy little vessels pulling, pushing and bullying the much larger vessels into position. Is there anyone who doesn't love 'sittin on the dock of the bay.. watching the ships roll in'.. go on I dare you to listen, super song to have stuck in your head :) Happy Sunday, take care and stay safe..
Upside down forest and the swamp creature.. 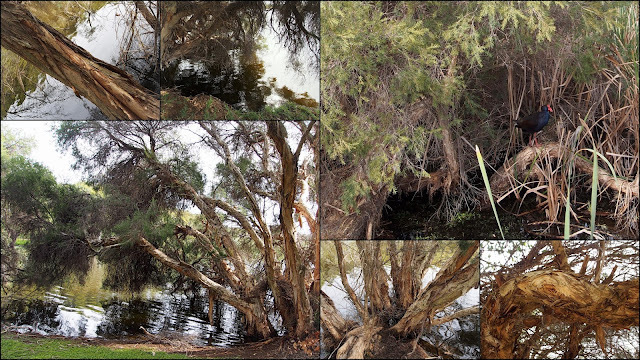 I should imagine it could be a bit creepy walking along the boardwalk through the forest of paperbark trees around Herdsman Lake when it gets dark but through the day when the sun is shining it's a fascinating stroll. They aren't the prettiest of trees but the multi-layered complexity of the paperbark trunk is an amazing sight. Funny story: It's the school holidays in Perth, walking along the boardwalk, through a swampy area, birds and things that live in the water making plip-plop noises all around I came upon a young mum trying to keep her two sons interested in the surroundings. 'We want to go home' etc. As I passed I said 'listen, can you hear? If you keep your eyes open you might catch sight of the swamp creature!' That was it, not another peep from them, they were too busy enthusiastically looking for monsters 😉 Young mum looking relieved gave me the thumbs up.. you're welcome! Kids, they're too easy :) Happy Weekend, take care and stay safe..
Plug. Me. In.. and drive me home! It's the first time I've actually seen an electric car charging up! It's a Tesla Model S (click the link) a pretty amazing piece of technology. If you look at the video on the link it begins by stating 'The person in the driver's seat is only there for legal purposes. He is not doing anything, the car is driving itself.' My first thought was how on earth is he sitting there so calmly without feet and hands twitching to grab the controls, I have a few friends, you know who you are :) who do that in the car when I'm driving, goodness knows why, no really.. goodness knows why 😊 What do you think, are you ready to let the machine take over? Happy Friday, take care and stay safe.. The shots I used yesterday for actual Anzac Day were taken last year, the shots here I took as dawn broke yesterday morning. Getting up at 4am in time to get to Kings Park, find a parking and a good spot to watch the service wasn't easy after three hours sleep, I really must get to bed earlier :) I think I have said before that standing with thousands of others, the silence broken only by the sound of the pipes as the wreathes are laid and the bugle as it plays the Last Post is quite a surreal experience.. even the young children seem to sense the solemnity of the event. I wonder, like most what this year will bring. Happy Thursday, take care and stay safe..
Up well before the crack of dawn today for the Anzac Day Dawn Service in Kings Park. I have so many mixed emotions on this day.. for the brave young men and women who fought and died in WWl 'the war to end war' and in WWll, including my dad, and all the wars since. I wonder what the veterans below think of the world situation today. A cynical quote from a British politician during WWl "This war, like the next war, is a war to end war" has proven true.. I very much hope that the young men and women marching below don't have to face the horrors of war.. look at those sweet faces. Yup, I feel tres emotional :) Happy Wednesday, take care and stay safe.. P.s. big catch up today..
City views from.. City Views! Caught up for lunch with mon ami français Marie yesterday in the tres aptly named City View Cafe in Optus Stadium. The stadium opened in January this year kicking off with an Ed Sheeran concert . I wasn't happy with any of my shots of the stadium but check out the images here.. incroyable! Just to the left of the shots above is where I'm once again having to reserve judgement.. I'll leave you with an abstract image until the project is fini, then we'll look at it again :) Mon ami français has already made her feelings known 'c'est tres hideous'. I seem to remember that's what many French people said about la tour Eiffel :) Happy Tuesday, take care and stay safe..
Work in progress.. Fremantle icons. I'm not sure if it's p.c. to have favourites but the two ladies below were mine :) Thai New Year is a joyful and colourful celebration. Happy Sunday, take care and stay safe..
Well it's definitely not the Sydney Harbour Bridge! Breaking from my traditional return from Sydney view of my favourite bridge I couldn't pass up the chance to take a look at this extraordinary piece of architecture by Canadian born American architect Frank Gehry. 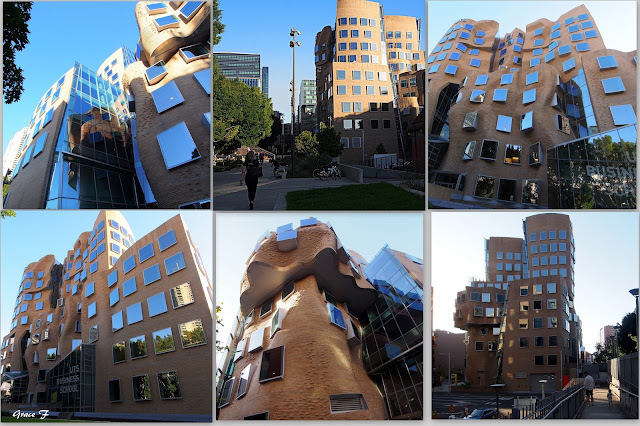 The Dr Chau Chak Wing Building, which officially opened in February 2015 is a business school building of the University of Technology Sydney. The building design is based on the idea of a tree house but is often described as a 'squashed brown paper bag'.. also quite rightly as a masterpiece.. what do you think? It is also the first and only Frank Gehry building in Australia which is a shame.. we need a wee bit of his imaginative fabulousness here in Perth. Bear with me as I catch up, happy Saturday, take care and stay safe.. P.s. new header shot taken a few days ago in Hyde Park.. autumn has arrived! Home again! Spending time with our Sydney famille is always a joy. While not technically perfect I loved the whimsical feel of the shot below, hopefully it reflects the fun and magic of turning four :) In a month my grandson will be two, how fast the time flies! Along with every other grandparent in the world I can't believe how lucky we are to have these two super special youngsters to enrich our lives. The week ahead is super busy, plus I seem to have picked up a bug along the way, so will restart the blog on Saturday with a whole new autumn feel. Looking forward to catching up and seeing what you have been up to while I've been away.. see you Saturday, take care and stay safe..
Out into the big blue.. à bientôt. .....or, on the way UP! The above shot would have been perfect for the 'one colour' theme on the 1st :) Below on the way up to the lookout point at Mullaloo Beach..
Western Ground Parrot.. Mural of Hope. Two fabulous murals.. one for Monday Murals today and one for next week as I will be in Sydney then. Mega talented Perth artist Brenton See whose work you have seen here many times created the 'Mural of Hope for the Western Ground Parrot' at the Perth Zoo to highlight their Western Ground Parrot breeding program. The western ground parrot, endemic to Western Australia, is one of the rarest bird species in the world, their numbers dropping rapidly mainly due to introduced predators and bush fires. Brenton's love of birds and wildlife inspired his Endemic Birds of WA Mural Project check out his blog here. You have to respect and admire the passion. Hope you are having a super Easter weekend, happy Monday take care and stay safe..
CDP Theme Day.. One Colour. The CDP Theme for the first of April is 'One Colour'. I admit that when I took this quick shot as we rushed past the tortoise enclosure to see the baby giraffe it didn't occur to me that it could be perfect for today.. fortuitous or what! All the shades of brown on the star shaped patterns on the radiated tortoise shell fit the brief perfectly, as could the skin of the zebra and the giraffes. The incroyably beautiful and amazing creatures of the world deserve to be treated so much better than they are by the supposedly highest intelligent species that is man.. I wish! Happy Easter Sunday, take care and stay safe..
Click here to see more CDP Theme Day images from around the world..